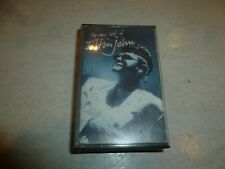 Elton John double cassette tape - The Very Best Of Elton John - UK issue from 1990 on Rocket. The cassettes are both in EX- condition. They play fine, but both shells have a little scuffing. The inlays are EX. THE VERY BEST OF ELTON JOHN 2 CHROME CASSTTES FATBOX 1990 HAPPENSTANCE POP ROCK Condition is Good. Dispatched with Royal Mail 2nd Class. UK Issue - 1974 DJM Records - Cat# ZCDJL 442. Classic Elton John album from 1974, original issue with the cassette in a olive green shell with white paper labels and an olive green outer shell. Cassette plays great and along with inner and case is in VG condition. ELTON JOHN. THE VERY BEST OF ELTON JOHN. HUNGARIAN 1990 CASSETTE DOUBLE MUSIC ALBUM. Cassette One Side One. Cassette One Side Two. Cassette Two Side Three. Cassette Two Side Four. CONDITION OF AUDIO CASSETTE TAPES : NEAR MINT CONDITION. IN VERY GOOD CONDITION- TESTED WORKING. ELTON JOHN - The Very Best Of. Presented in a great original Cassette box complete with picture Insert. This is one of 10000 singles LP's, 12” and 7" that I HAVE COLLECTED OVER THE LAST 30 YEARS; they run from the 1950's to the 2000's and cover every style of music. Candle in the Wind 1997. Has not been played. Release date unknown. In excellent condition with picture inlay. Candle In The Wind. Sorry Seems To Be The Hardest Word. The cassette and inlay are both in EX condition. UK 2nd class - free. The Heart Of The 80s and 90s double cassette (1998) featuring Elton John, Simply Red and more. All in very good condition. Sleeping with the Past Sacrifice 5:07. Sleeping With The Past 4:59. Healing Hands 4:24. I Feel Like A Bullet (In The Gun Of Robert Ford) 5:30. Stone's Throw From Hurtin' 4:55. Dan Dare (Pilot Of The Future) 3:25. ARTIST; ELTON JOHN. TITLE; SLEEPING WITH THE PAST. Candle In The Wind 1997. All Cassette Tapes have been checked and tested to ensure that they play well. ARTIST; ELTON JOHN. TITLE; REG STRIKES BACK. ARTIST; ELTON JOHN. TITLE; RECOVER YOUR SOUL. TITLE; DUETS. ARTIST; ELTON JOHN. 1990 Happenstance / Phonogram / Rocket records - 846947-4. 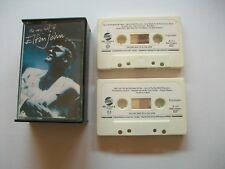 Elton John - The very best Of - 2x Cassette tape Albums. play tested working. ARTIST; ELTON JOHN & KIKI DEE. 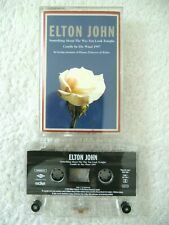 ELTON JOHN - THE VERY BEST OF - TAPE CASSETTE. TAPE CASSETTE/INLAY CARD/CASSETTE CASE IN VERY GOOD CONDITION. 16 –Elton John Duets For One 4:51. 2 –Elton John & P.M. Dawn When I Think About Love (I Think About You) 4:34. 3 –Elton John & Little Richard The Power 6:24. 4 –Elton John & Don Henley Shakey Ground 3:50. ARTIST: Elton John. Each cassette has been play tested on both sides. The cassette should play ok although the sound quality may vary depending on the system you choose to playback the cassette on. Ensure the cassette has been rewound and the tape is not loose. 1993 Happenstance / Rocket records - 518 478 - 4. ELTON JOHN - Duets - cassette tape. Cassette,cover and case in very good used condition, nice cover / pullout. Elton John - Something About The Way You Look Tonight/Candle In The Wind 1997 Single Cassette Single / Elton John - Something About The Way You Look Tonight / Candle In The Wind 1997 Cassette Album Condition Used as in the photo and specifics Payment with Paypal only Our reference : B-17005 Please refer to the photo for your original item. All the stock we offer is original. ELTON JOHN CANDLE IN THE WIND. Catalogue number is RMC 53108. The Superior Sound of Elton John (1970-1975), Cassette Tape. The case itself is in good condition for it's age as is the cover insert. The tape itself also plays well. ELTON JONES- Special Edition-- for -- DIANA- :Princess of Wales Memorial Fund- Something about the way you look to-night--Candle in the Wind -1997. THIS CASSETTE SET IS IN VG CONDITION!